This is the perfect brownie for fudgy brownie lovers and other serious chocaholics. 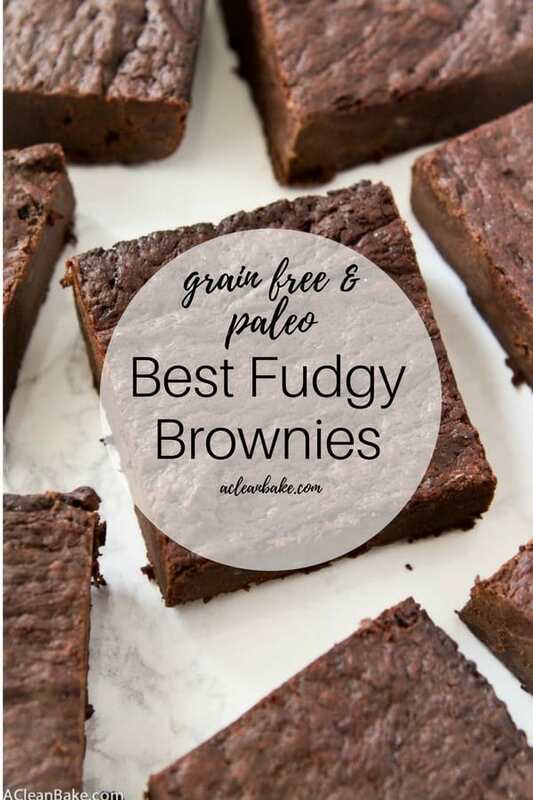 It is the ultimate paleo fudgy brownie recipe! If you have gotten around to watching the latest season of Chef’s Table on Netflix, you may have seen the episode that profiles Nancy Silverton (if you don’t know her name, you may have heard of La Brea Bakery, her claim to fame) and her obsessive drive to achieve perfection in her recipes. Once she gets something in her head – like “I want to recreate such-and-such dish” or “I want this to taste like xyz” – she keeps working until she’s done it. She doesn’t settle for good enough, ever, even if it means spending an entire year perfecting the recipe for a loaf of bread that, I’m guessing, was probably pretty good a month into her recipe development process. Coincidentally, I happened to watch the Nancy Silverton episode about a batch or two before I was finally happy with these brownies. See, I’ve been working on these for a couple of years now, on and off. There is no question that there are plenty of brownie recipes on this site (brookies, dark chocolate peppermint, cookies, beet-based, black bean-based, pumpkin cheesecake swirled, and even a dip) – but while they are all, admittedly, quite good, they were created at the “one month mark”, so to speak. While they are all good, not a single one was perfect. Not one was my dream brownies. And I just couldn’t let go of the elusive perfect brownie, denser than perhaps it should be and dangerously fudgy; the one that tasted and felt on my tongue as good as it did in my head. DENSE. Cakey brownies have their place, but that place is not in my perfect world. Fudgy. I guess this is related to the above, but with density comes intense richness and silkiness. 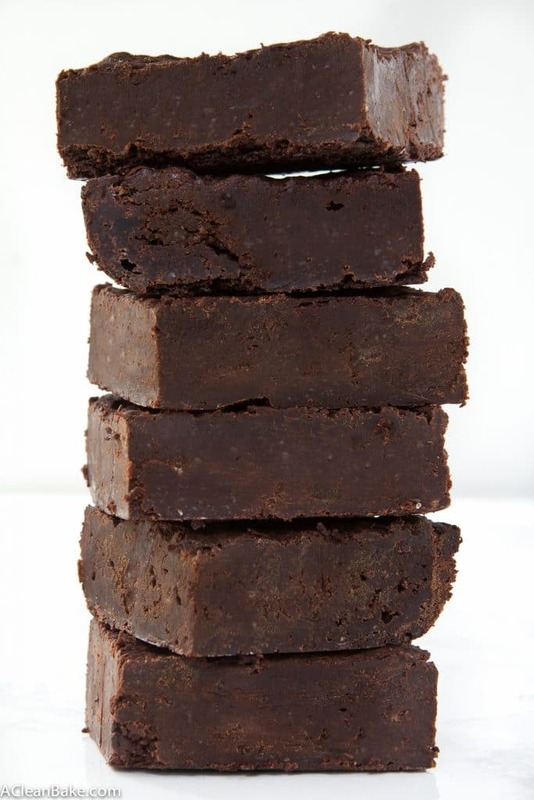 The perfect brownies should be one rung below straight up fudge. Not too, too sweet. Call me crazy, but if I pack 53 lbs (estimated) of chocolate and cocoa (specifically, this kind – NOW Foods makes the best cocoa powder out there, if you ask me) into a square the size of the palm of my hand, I want to taste it. The salt, vanilla and espresso powder in the recipe all support and enhance the chocolate flavor, but it’s important to resist drowning it out with sweetness, too. The perfect brownie is sweet, but just barely, so that it teeters right on the bring of bittersweet without tumbling over the edge. Easy. Some of the best brownies I’ve ever baked have had two fatal flaws. The first was that they were made with wheat flour and white sugar, and the second was that they were fussy. The perfect brownie recipe does not require: 104 bowls, a stand mixer, a double boiler, or a special pan. It requires one bowl (ok, two if you follow the instructions precisely, which I recommend but admittedly don’t always do, and mix the dry ingredients before adding them), a fork or whisk, and a standard 8″ square pan. If it seems like a reasonable list, it is – in theory. But when your dream brownie is just out of reach, there is no such thing as too many tweaks, too many bars of chocolate on hand, or too much available freezer space. Let’s just say that a lot of people have been forcefully gifted a lot of brownies lately. But… I think I did it. I love these. They are the brownie of my dreams, the one I could taste and spell and almost touch when I closed my eyes, but they were always just out of reach. And it’s not just me. One of the people who taste tested several batches told me that I could probably get her to do anything for these brownies. She calls me her dealer. Another – a self-professed junk food addict – apparently inhaled them and asked if I sold these anywhere. And even though I was sure these wouldn’t be sweet enough for a kid’s palate, a 6 year old and a 4-and-a-half (she’d want to make sure I mentioned the half) year old declared them “the best brownies ever!” That’s a direct quote, and yeah, I was pretty proud of that. So, I challenge you – no, I dare you – no, I beg you to try these for yourself. If they aren’t the brownies of your dreams well then… we’ll just have to agree to disagree 😉 And I’ll have a cakey brownie recipe coming soon! In a large, heatproof bowl, melt the oil/butter and chocolate in the microwave (in 30 second increments, stirring in between). If you prefer, you can create a double boiler on the stovetop. Stir constantly and remove from heat just when the mixture becomes smooth. As soon as the oil and chocolate are completely melted, stir in the cocoa powder. Continue to stir until the mixture cools slightly (you should be able to comfortable hold your finger in it for 30 seconds). Once the eggs are incorporated, stir in the maple syrup and vanilla. In a small bowl, whisk together the stevia/monk fruit, salt, espresso powder and baking soda. Then add the dry mixture to the wet and stir to combine. Bake for 40-50 minutes, until the batter is no longer gelatinous (if you shake the pan, it won't wiggle), and the top loses its sheen. You can substitute butter for coconut oil. Except for the chocolate and oil, make sure all of the ingredients (e.g. eggs, maple syrup, etc) are at room temperature when incorporating them into the batter. 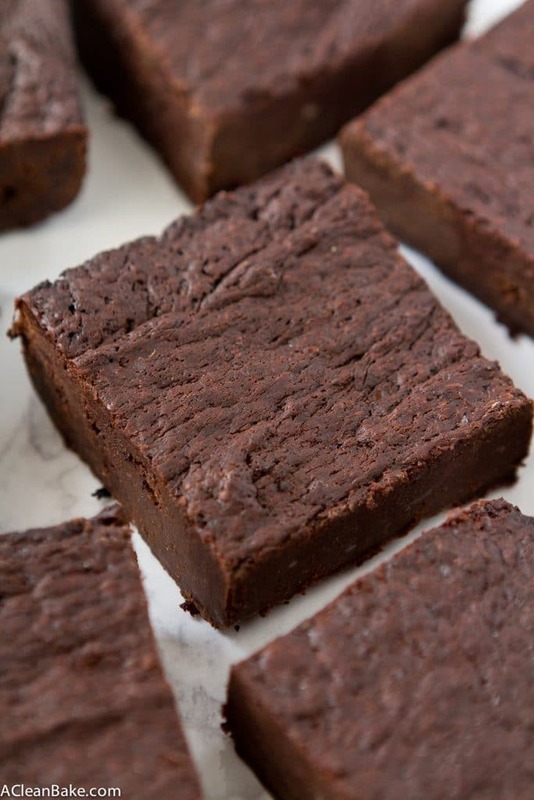 These brownies are easiest to cut when chilled in the fridge for a couple of hours. For best results, bring the brownies back to room temperature (after cutting) before serving. Oh wow, I am SO excited about these! Love that there’s no flour at all–they look like flourless chocolate cake but better. Cannot wait to try!! 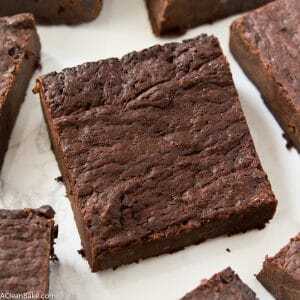 These brownies look like absolute perfection!! Brownies have always been my favorite dessert and I love the way your recipe looks – definitely going to try them. Still need to get a hold of some Monk fruit sweetener and them I’m ON it! I recently found monk fruit in a granulated form. A pound bag was under $15.00. Just arrived yesterday and tasted it. Wow! Like real sugar. 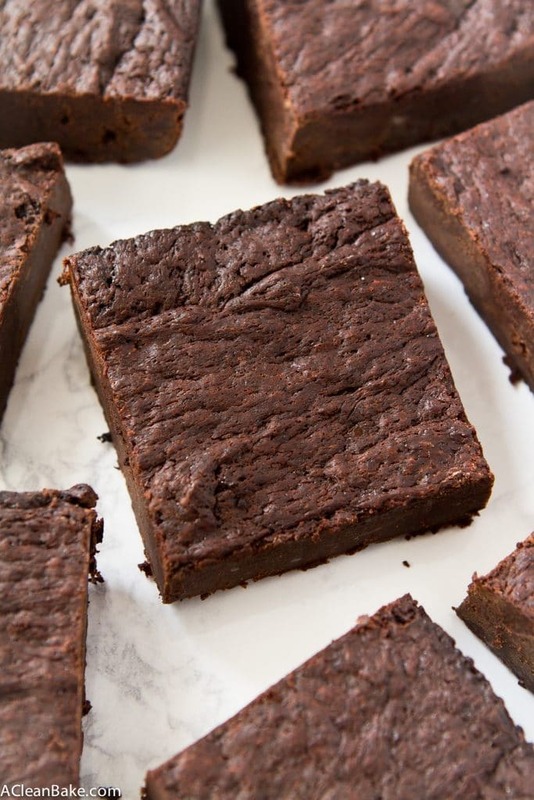 Going to use it in this paleo brownies recipe tomorrow. Can erythritol work here too?